Mumbai: New York-based private equity fund WL Ross and Co. Llc., which in August agreed to invest $80 million (about Rs370 crore at the current exchange rate) in low-fare airline SpiceJet Ltd, has, on its own, started talks with Jet Airways India Ltd and Kingfisher Airlines Ltd for a possible merger with the Delhi-based carrier. Ross, part of investment management firm Invesco Ltd, has also started discussions with other low-fare carriers for a possible merger in an attempt to create a larger airline, said a person familiar with the development. “The idea is to increase the valuation of SpiceJet or the money invested by WL Ross before the firm exits," this person added, asking not to be named. WL Ross has also suggested strict cost controls and tighter management to turn around SpiceJet, he added. 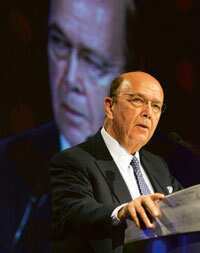 An executive at the firm said Wilbur L. Ross Jr, chairman and CEO, was not available for comment as he was travelling. Ajay Singh, director, SpiceJet, did not answer calls to his mobile phone or reply to text messages. Parthasarathi Basu, SpiceJet’s chief financial officer, couldn’t be reached. A senior executive with the UB Group, which owns Kingfisher Airlines, India’s second largest private carrier by passengers, confirmed the Ross approach and would only say: “The talks are at a very preliminary stage." Wolfgang Prock-Schauer, chief executive of Jet Airways, which together with subsidiary JetLite is India’s largest airline, did not answer calls or reply to text messages. Ross had agreed to invest in SpiceJet in two tranches, by buying out its foreign currency convertible bonds from Goldman Sachs Group Inc. of the US and Istithmar PJSC, an investment house based in the United Arab Emirates. The private equity fund also managed to get Goldman to invest $20 million in SpiceJet. “It is quite logical that Wilbur Ross is talking to SpiceJet rival carriers for a possible merger," said another person familiar with the development. “Ross was never a strategic investor, but a financial investor. He fully understands that the Indian civil aviation market requires another round of consolidation since all airlines are losing money." Domestic airlines in India are expected to post a combined loss of $2 billion in financial year 2008-09 because of high jet fuel prices and overcapacity in the market. SpiceJet, which operates 94 flights daily to 16 cities with 15 Boeing planes, has a market share of 8.5%. In a statement during the fund’s investment in SpiceJet, Ross had said, “This financing is intended to give SpiceJet the staying power to get through the industry consolidation that is under way." On Thursday, SpiceJet shares dropped 7.21% on the Bombay Stock Exchange, or BSE, to close at Rs23.15 a share, with about 656,000 shares changing hands, higher than the average daily trading volume of 484,000 shares in the previous two weeks.